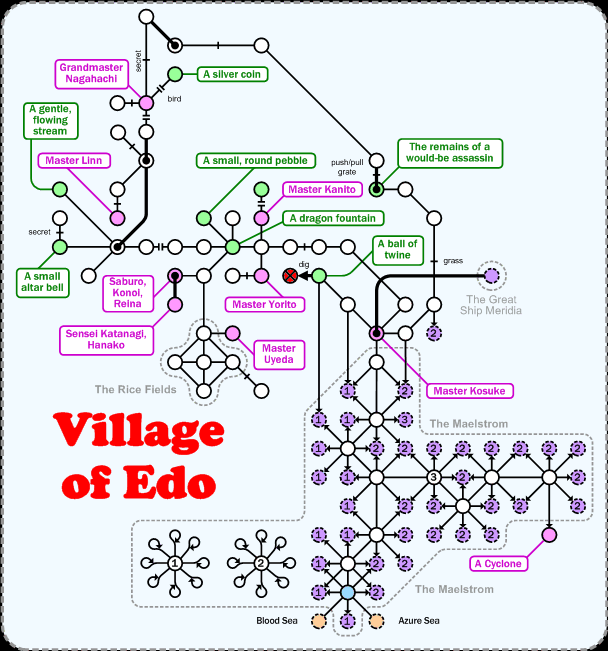 Village of Edo, very nice, but sometimes a struggle because you need to be IP1 to even get into the area. You'll hit a DT if you dig in the room 2nw of Master Kosuke, don't do it. Cyclone is the simplest run, but the Grandmaster pops a lot of cool stuff too. Walk ( nw, 2w, 4n, e, look painting, open n, n, 26w, 2n, ne, nw, n, nw, 2w, 6n, nw ) to get from DH to the room marked in blue.